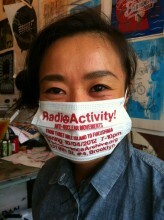 RadioActivity! Antinuclear Movements from Three Mile Island to Fukushima explores the culture of antinuclear movements around the globe, past and present. We have assembled posters, publications, moving images, and ephemera that reveal the many creative forms of resistance that have emerged. From the disaster at Three Mile Island that galvanized the movement in the 1970s to the meltdown at Fukushima in 2011, antinuclear groups have addressed a multitude of issues including feminism, antimilitarism, anticapitalism, peace, alternative energy, environmentalism, and most important, everyday survival. Todos Somos Japon is a New York City-based, international coordination and solidarity project, in the post-3/11 world (3/11/2011: the day of massive earthquake that triggered Fukushima nuclear meltdown in Japan).